Morgan surely knows League 1 well – moreover he was part of teams that gained back to back promotions to the Championship division with both Peterborough United and Rotherham United. The 30 year old Welshman was born in Flint and began his footballing career some 15 miles away at Wrexham, making his debut for them as a 16 year old. He was to play for the Welsh club for three years before allowing his contract to run down after 52 appearances. In summer 2005 he joined MK Dons and made 47 appearances that season. He made his debut for Wales in October 2006, but a week later he re-joined Wrexham on a one month loan, making two appearances before being sent out on loan to Peterborough United at the end of November. The initial loan turned into a permanent transfer in January 2007. He was to make 41 appearances in the 2007-08 season when the Posh won promotion to League 1. At the beginning of the 2008-09 season Morgan was made captain at the age of 23. The Posh finished runners up to Leicester City, gaining promotion to the Championship. Morgan went on to make 125 appearances for them in three and a half seasons, before Preston North End paid £400,000 for him to rejoin his former Peterborough manager, Darren Ferguson. A few months later Ferguson was sacked and replaced by Phil Brown, Preston being subsequently relegated to League 1 at the end of the season. Morgan’s contract at Preston was cancelled by mutual consent on the transfer deadline at the end of August 2012. He had made 50 appearances. 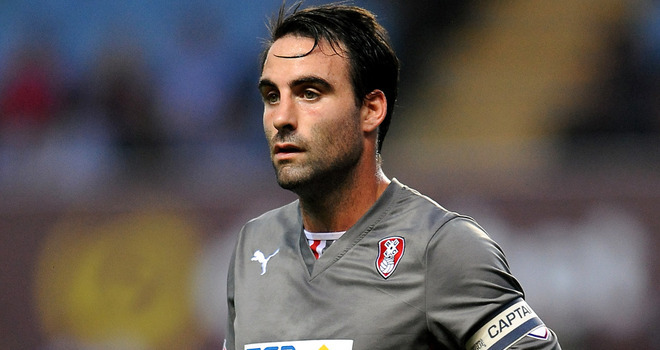 Morgan joined Rotherham United and they gained promotion to League 1 in that 2012-13 season. The following season Morgan was made captain, with them beating Leyton Orient in the League 1 playoff final. Morgan continued to captain the side as the Millers managed to stay in the Championship last season. Despite having an offer of a new contract from Rotherham he chose to join Latics, turning down an approach from Bolton Wanderers. Morgan had made 83 appearances for Rotherham. He has 23 caps for Wales. Craig Morgan will be the perfect signing for Wigan in League One. A leader by example, Morgan has plenty of experience of winning promotion in that division and will be a focal point of the defence. He’ll win his headers, he’ll make his clearances and be strong in challenges. He is also comfortable in possession and is not a hoof merchant. One thing he does lack his pace, but he makes up for it with his positional sense. He could also be better in the opposition box as he does not provide much threat from set-pieces.